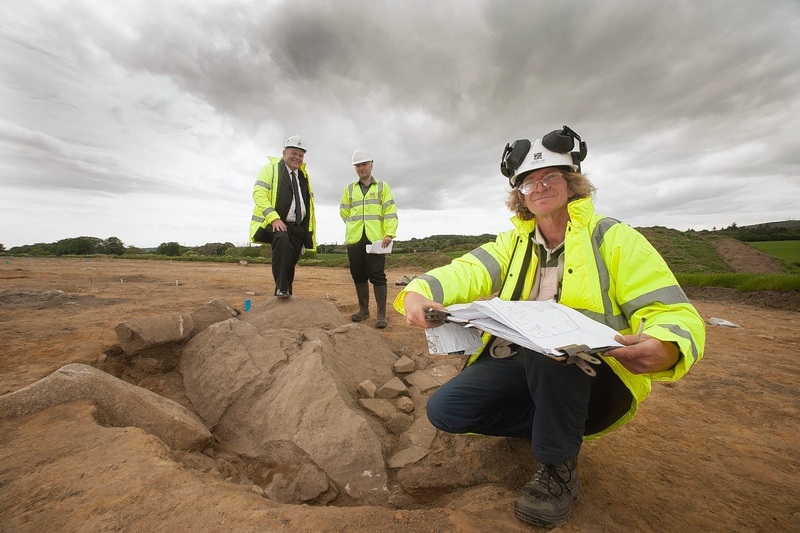 Evidence of industrial, agricultural and domestic archaeology, dating from up to 4,000 years ago has been found at the site of the Dyce Park and Choose and Dyce Drive link road site. The finds include 4,000-year-old pottery from the early Bronze Age, the remains of timber roundhouses, and evidence of Iron Age smithing and domestic life. The site has real regional significance and adds considerably to a wider understanding of early habitation in the area. Aberdeen City Council employed AECOM and Headland Archaeology to carry out an archaeological investigation ahead of construction work for the 999 space Dyce Park and Choose site and the Dyce Drive link road getting under way. The team has discovered evidence of industrial, agricultural and domestic activity dating from the early Bronze Age (2300BC) through to the 1800s. The work has been carried out on a relatively undisturbed piece of ground in an area where finds from prehistory onwards have been made in the past. For that reason, a condition was attached to the planning permission for the site requiring archaeological work to be carried out prior to development. This dig was carried out because the initial archaeological evaluation revealed a range of archaeological features which required further examination. Archaeologist Steve Thomson said: “Domestic occupation in the area has been found in the form of the remains of timber constructed roundhouses, with hearths and remnants of compacted floor and activity surfaces, which so far seem to indicate prolonged occupation on the same site, with phases of rebuilding occurring. Medieval agricultural activity has also been discovered and later ridge and furrow field systems, with the remains of possible farm buildings evidenced on site. Mr Thomson added: “There is a wonderful jigsaw of people working and living within a landscape, which seems to have provided all they needed right up to the present day, and the pieces of that jigsaw are allowing the archaeological team to truly see the picture. “The continuity of use of the land is remarkable. Clearly a sense of place was important, not purely for practical reasons. Seeing the landscape, even today, helps the team understand why it was a focus for so long for continued use. It is genuinely exciting to be so close and even walk on surfaces our predecessors used thousands of years ago. Small pits and post-holes can be seen on the ground. Some of the post-holes are arranged in circular groups with entrance ways interrupting the circle. These are from the foundation posts of roundhouses. Once the excavation is complete, the results and finds will be carefully analysed by the excavators and a variety of experts, before a report is written and published. This will include radiocarbon dating of suitable charred material (charcoal). Objects which have been found will be reported to the Scottish Archaeological Finds Allocation Panel, which will allocated them to a registered museum.